Although marina life is easy-peasy-relaxing, we really like to be at anchor. It’s nice to leave the dock behind and find a beautiful place to swing on the hook. Abaco has lots of great anchorages. 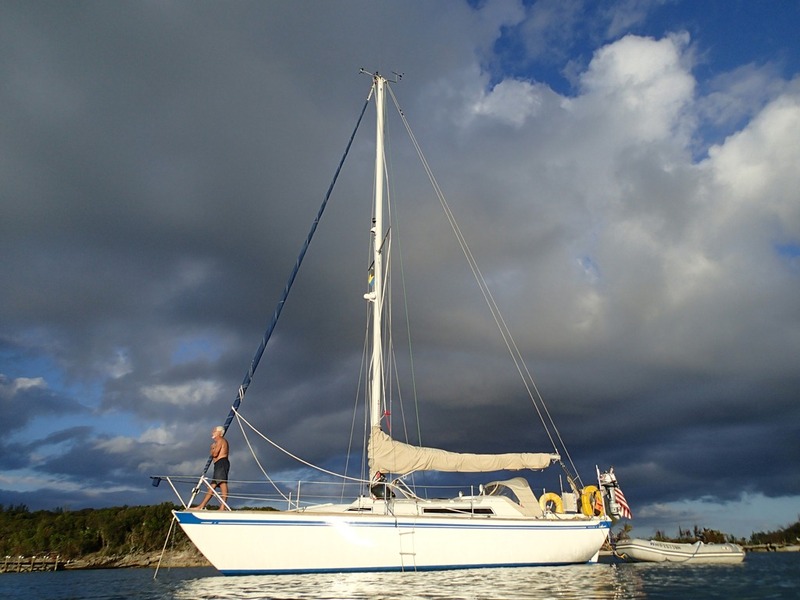 We thought we’d have a nice sail, but ended up motoring – the Sea of Abaco was FAC. We opted out of the play-off games and headed for the Foote Cays, literally in the middle of the Sea of Abaco, near Great Guana Cay. Turns out the Footes are not particularly attractive and the bottom did not offer good holding. So we headed east to the south end of Great Guana. We anchored almost right on the spot that the chart indicated was a designated anchorage. 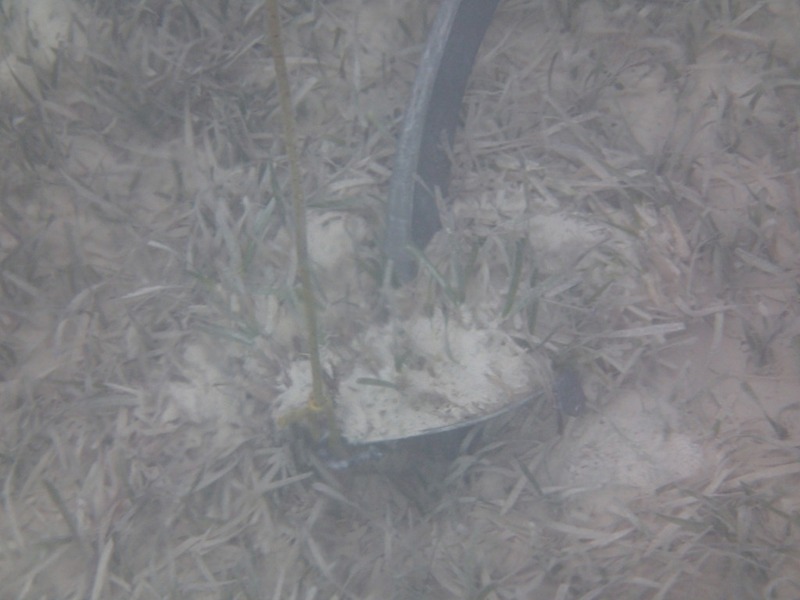 Oops – look what we found on the bottom after we dropped the hook. Glad we didn’t get the anchor caught up in that mess. Maybe an abandoned car – or golf cart – or parts thereof? So we moved a bit north and were just fine, although the anchor clearly struggled to get a good bite in very hard sand and grass. Yep, that’s our anchor – would be easier to see if I had software to enhance the picture a little. This was taken underwater, at about 10 feet, but the sun was low. Anyway, we had a great time swimming and snorkeling. 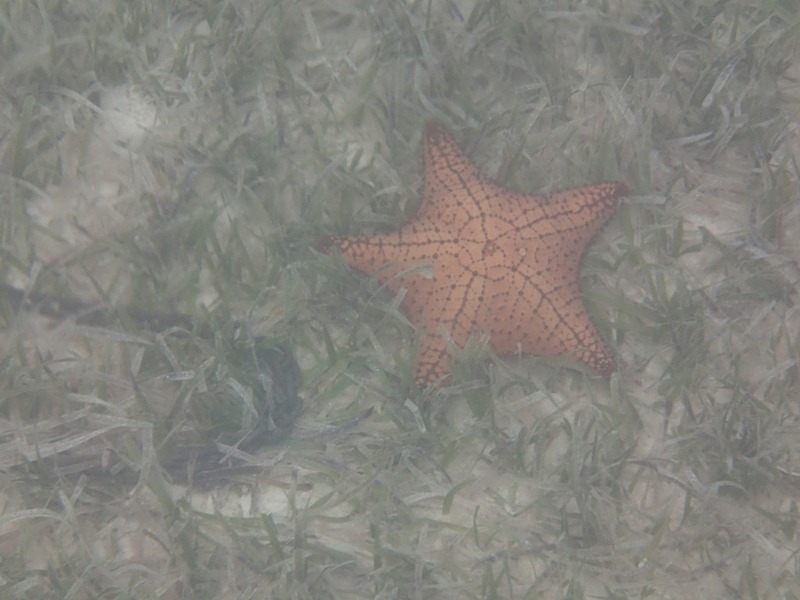 Here’s our anchor chain looping right next to a starfish. 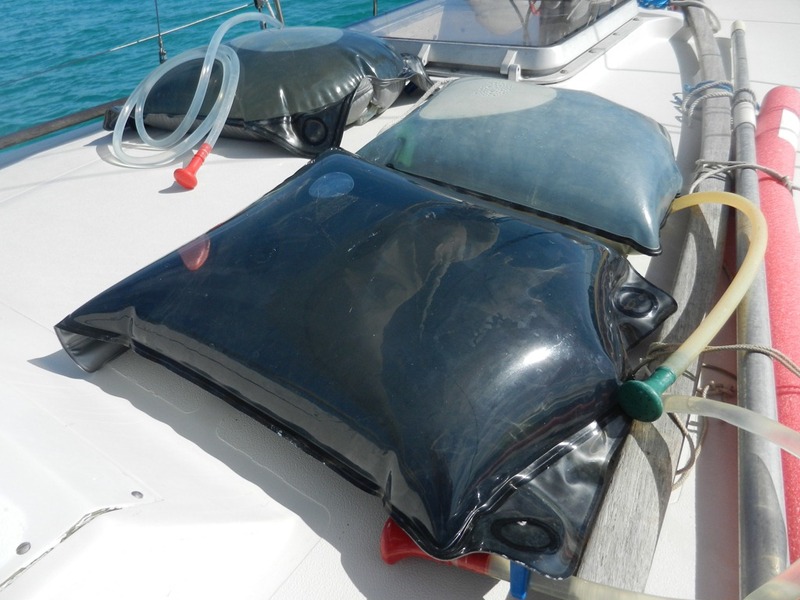 We took hot boat showers – we have plastic bags we fill with water, which warms up in the sun – great showers. 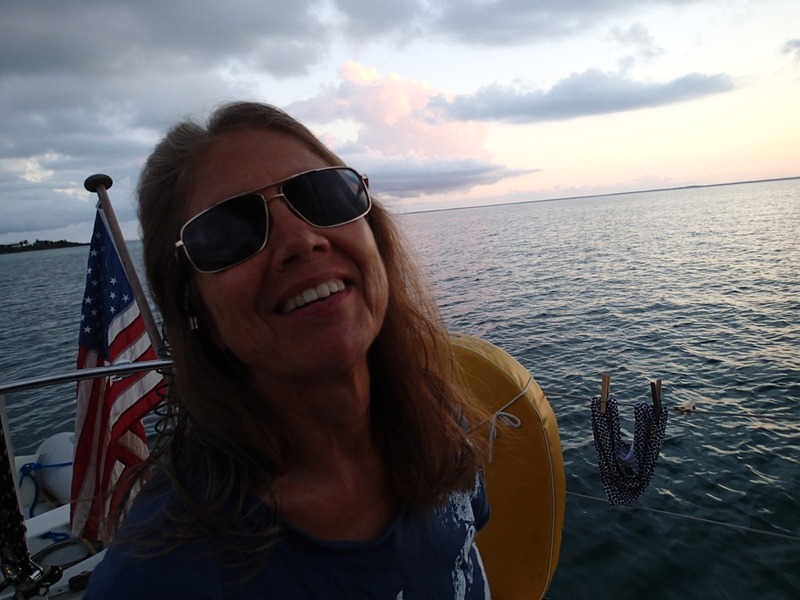 Then we ate our grouper (purchased at the Hopetown Post Office dock from local fishermen) and watched the sunset. I tried to blow the conch when it set, but was not very successful. A boat anchored nearby also tried – dueling pathetic conch bleats. Oh well. 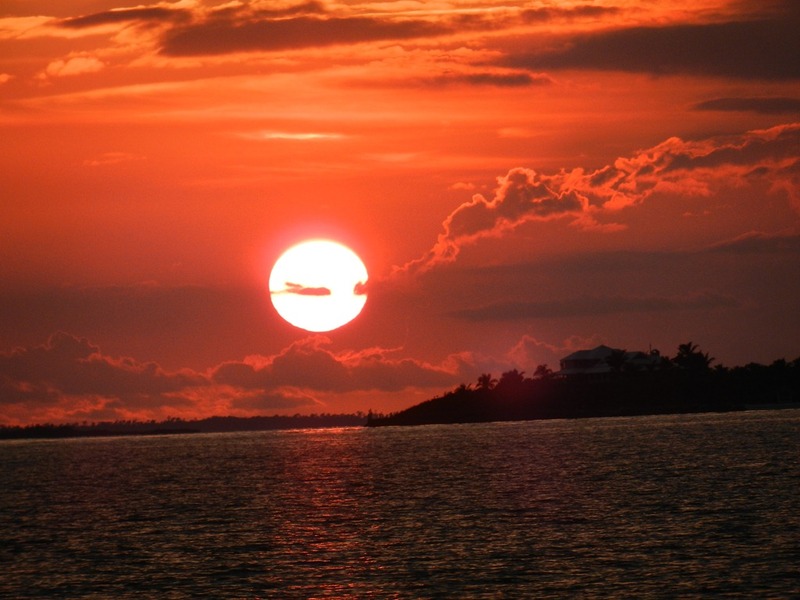 We ended this beautiful day skyping with our daughter and son-in-law in Annapolis and our friends George and Jackie who are in the Berry Islands, north of Nassau. Very fun. So i was surprised that you have internet out at anchor. What are you using? I figured I would only see a SPOT. Enjoyed the great pictures. How cool that you can photo the anchor underwater. Loved the fat star fish!!! What a sunset. Love those solor shower bags too. Even in a short couple hours (after a day on the river) it heated up Colorado River water (65 degrees) on our trip last year. Much more enjoyable. You look great! That photo of Motu Iti is stunning!!! Glad you left the marina for some fun and change of scenery. 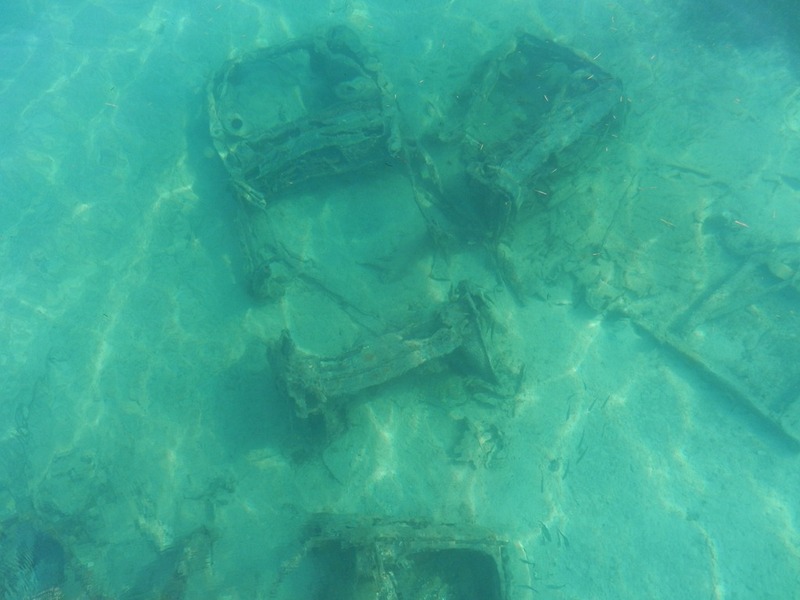 The sunken car would be a good hiding spot for lobsters. Keep practicing the conch horn! Thanks. It’s that new super duper underwater camera. Takes great pics. You need Amelia to blow the conch for you. I recall she was good at it. Michigan very cold today–single digits. Suffering more from “freedom to work” however than the cold. So good to hear from you. 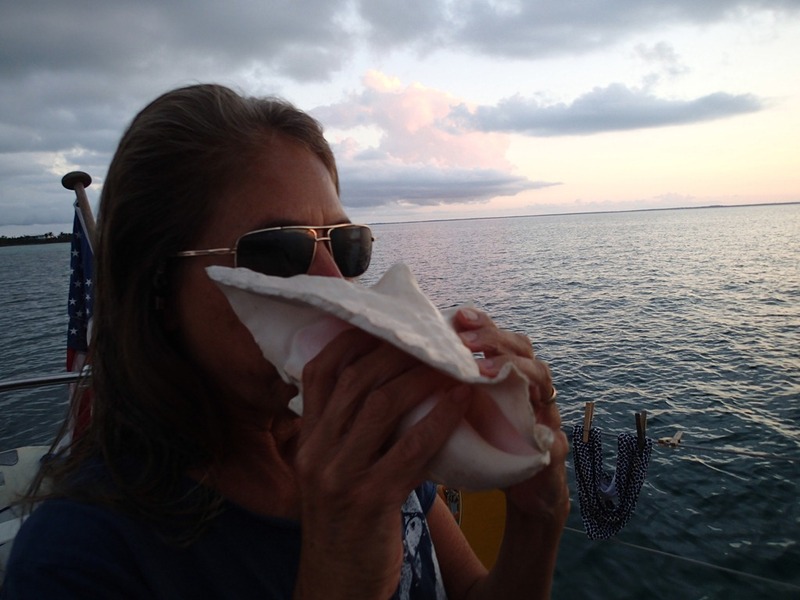 Amelia will get to blow the conch this week-end when she and Grant are here visiting. Can’t wait. Meanwhile, listening to Motown and forgetting about winter and crazy, mean-spirited politicians. Y comment more when I’m caught up in your adventure.. Be safe and enjoy. Thanks so much for sharing our adventure. You will do it too and you will have a great time. And we will be reading your blog. Thanks for your comment. Motu Iti has a 5′ draft. So did the last boat we took to the Bahamas. We have to be careful about the tides, but generally we can go most places. Sometimes we are envious of the catamarans with their shallow draft. But mostly, we are fine with 5′.